James Kourtney Reimer (born March 15, 1988 Arborg, Manitoba, Canada) is a goaltender for the Toronto Maple Leafs of the National Hockey League. Reimer was selected by the Maple Leafs in the fourth round (99th overall) of the 2006 NHL Entry Draft. He started playing minor hockey in his hometown when he was 12. He played junior hockey with the Red Deer Rebels of the Western Hockey League, after being selected in the fifth round of the 2003 WHL Bantam Draft. After turning professional, Reimer played with the South Carolina Stingrays and Reading Royals of the ECHL, as well as the Toronto Marlies of the American Hockey League. Reimer was named the most valuable player of the ECHL playoffs, as the Stingrays won the Kelly Cup in 2009. 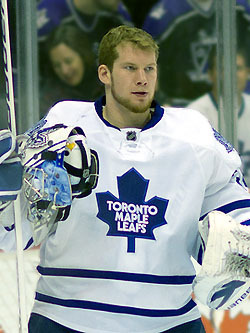 Reimer made his NHL debut with the Maple Leafs during the 2010–11 season and went on to replace Jean-Sébastien Giguère as the Maple Leafs' starting goaltender. He plays for Canada internationally, and first represented his country at the 2011 World Championship.